Locks are used to make a river easier to navigate or to allow for a canal to follow a reasonably direct course across country which isn’t level. To the uninitiated, they can seem quite intimidating but once you’ve practised going through them a few times, they’re quite easy to understand. What complicates matters a little is that there are different types of locks in terms of how they operate so you’ll need to familiarise yourself with the various types and there are locks which are manned (where you’ll be guided through the process by the lockkeeper) and those which are unmanned which you’ll need to learn how to operate yourself. You should not be daunted by this, however. Every year, thousands of people take holidays aboard narrowboats and other river craft who have never been boating before in their lives and via some basic instructional advice first and with the help of the handbooks on board, most of them are able to successfully navigate locks without a problem - it’s simply a case of knowing exactly how to work a lock before you enter it and it’s fairly straightforward. As many of them work differently however, this article aims to focus on the basics of things you should check first, what to be wary of and the basics of going upstream or downstream. However, if you’re navigating a particular stretch, try to find out how each lock is operated en route and whether it’s manned or not. Make sure you know exactly how to work a lock before you enter it. If it’s manned, just follow the lockkeeper’s instructions but if it isn’t make sure you know beforehand how it works. As you approach the lock, ensure that nobody is standing on the foredeck or the roof of the boat as locks can be very narrow and any slight bump against the sides can throw people off the boat and into the water. Also make sure you don’t trap your fingers in any of the mechanisms and that all people onboard are well inside the boat and away from its sides. Any pets on board should be kept well inside the boat. 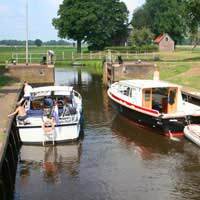 Once the boat is fully moored inside the lock (and make sure it is fully inside), then turn off the engine and ensure that the boat is fully secured inside the lock by looping the warps of the head and stern to the rings, posts or bollards but don’t tie them. If you’re going upstream and the lock is full of water, make sure that the paddles in the upper gates are shut. Then open the paddles in the lower gates to empty the lock. Then open the lower gates, enter the lock and close the paddles. Close the bottom gates then open the top paddles to fill the lock. Then open the top gates to let your boat out. Close the top gates behind you and then lower the paddles. When you’re going downstream and where the lock is empty of water, close the paddles which will then start to see the lock fill. Then open the top gates and enter the lock. Close the top gates behind you and lower the paddles. Then, you need to open the bottom paddles to empty the lock then open the bottom gates and you can then take your boat out. Finally, lower the paddles but leave the bottom gates open. This might all seem confusing but by getting information about each lock you’ll be navigating through, they will usually come with diagrams, drawings and/or photographs which will enable you to see how the process all works. And it’s true that once you’ve started navigating locks, it tends to become second nature the more you do it and your primary concerns will be more to do with ensuring that the likes of any children on board are following basic safety awareness whilst you’re going through them. It’s accepted practice and good boating etiquette that, wherever possible, you let another boat use the lock at the same time as you as this saves both water and time. Never use a lock at night or when it’s dark as it’s very easy for somebody to fall off the boat and not be seen or heard. When the water rises or falls, don’t forget to adjust your mooring lines in order to keep them taut and keep distractions to a minimum such as turning your radio off so that you’re aware of all that’s going on around you and, if a manned lock, you can follow any instructions clearly. And, in the event that somebody does fall into the lock, close all the paddles straight away and throw them a lifebelt immediately, then work out how you intend to get them out. It must be re-emphasised, however, that once you’ve navigated a few locks, it’s a fairly straightforward process you’ll become accustomed to. You should also factor in the additional time it will take to get from A to B on your journey if you’ve got to negotiate any locks along the way as, obviously, this will hold you up as opposed to straightforward cruising. However, there are plenty of printed guides and online resources which will estimate a journey’s time taking lock navigation into account so that you can plan any trip accordingly.